Thanks to Andrew VanDerLinden from Organized KidMin for this article. Every week, every parent is going to ask their kids, “What did you learn today.” If you are like me, you want the kids in your ministry to know, and to be able to communicate this to their parents. What a waste to teach all morning, and to have no one remember what you taught. 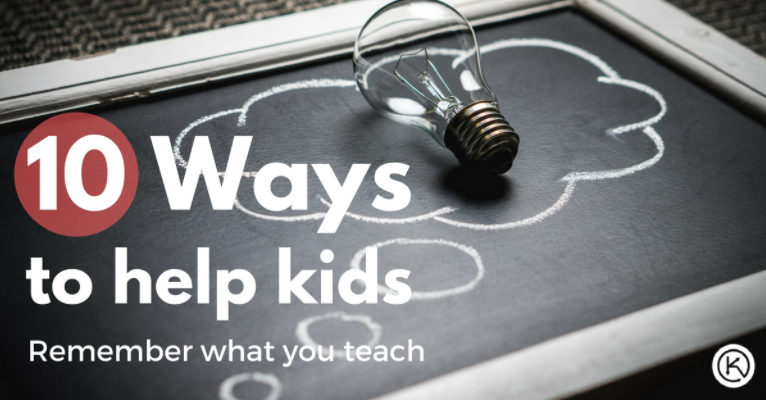 Below are 10 ways you can help the kids in your church remember what you teach. Most people, kids included, learn best by interacting with others. They need opportunity to talk, ask questions, and articulate what they are learning. If your ministry is lecture only than your kids are not remembering as much as they could. Create time for interaction, consider using small groups. Half of the brain is dedicated to visual function. 65% of the population are visual learners. When you use images, along with linguistics, your success rate increases drastically. Avoid trying to pass along to much information. Have one main focus. One big idea to point everything to. The intro, game, powerverse, big idea, main focus, Bible story, message, small group time should all point to one simple truth. If you try to teach to much, they won’t remember any of it. If possible continue to teach a key truth over the course of several lessons. This will really raise the retention rate of your kids. Anything you say just one time will either be forgotten or possibly not even heard. If you want the kids to remember, you need to repeat it over and over. Things repeated 6 times or more increase retention by 90%. So say it multiple times, in different ways in order for kids to remember. Reach all of the different learning styles. You need to know and hit all the different learning styles. Do your best to reach each one every week. Each child has a different mix of learning styles. Don’t fall into the trap of only utilizing the learning style that you best learn with. Try to hit as many styles as possible, it will aid in kids remembering more of what you are trying to teach. Visual (spatial): prefer using pictures, images, and spatial understanding. Aural (auditory-musical): prefer using sound and music. Verbal (linguistic): prefer using words, both in speech and writing. Physical (kinesthetic): prefer using body, hands and sense of touch. Logical (mathematical): prefer using logic, reasoning and systems. Social (interpersonal): prefer to learn in groups or with other people. Solitary (intrapersonal): prefer to work alone and use self-study. A good rule of thumb is one minute for every year. With a five year old, you have five minutes. Less if you are boring, ill prepared, and don’t communicate with energy and passion. A good communicator utilizing various teaching techniques can stretch this time. This is why we do so many segments in our kids church. We utilize short video clips, music, objects, and pictures in an effort to captivate the children’s attention. Kids won’t remember what they don’t pay attention to. Kids in a large group will naturally gravitate and give their attention to whatever is the most exciting thing in the room. Choose to be the most exciting thing. Every week use common objects that the kids will see to teach spiritual truths. Every time a kid sees that object they will be reminded of the spiritual truth. Train the kids that every time they are reminded by an object to share it with an adult. Clearly define how to apply the lesson to their lives. Every week you should challenge your kids to live out what they are learning. You need to be able to boil it down to one or two simple actions they can take as a result of your lesson. Information without application is useless. Our goal is life change and that only comes through application. Most are good at reaching kids through their eyes and ears. We need to take it a step further. In order to take information and move it from short term to long term memory you need to utilize all the senses. The more senses you utilize the better they will remember what they learned. Look for opportunities for kids to touch, smell, taste, see and hear what you are teaching. Look for ways to create an experience. Help them feel the tension of the truth. How does your lesson apply to their world. Be clear, engaging, and relevant. BONUS TIP: Come right out and tell the kids what they learned. There is no shame in this. At the end of the expereince. I will say, “Remember, today we learned…What are you going to say when Mom or dad asks you what you learned?” I tell them and then I have them tell me. If they can’t tell me what they learned, they won’t be able to tell their parents.